You knew it would be inevitable... Whenever something new lands in Vancouver and ultimately becomes successful, there will be an array of other choices. The resurgence of soft-serve ice cream, outside of DQ and the one at the PNE, started with Soft Peaks and has influenced a few new competitors. 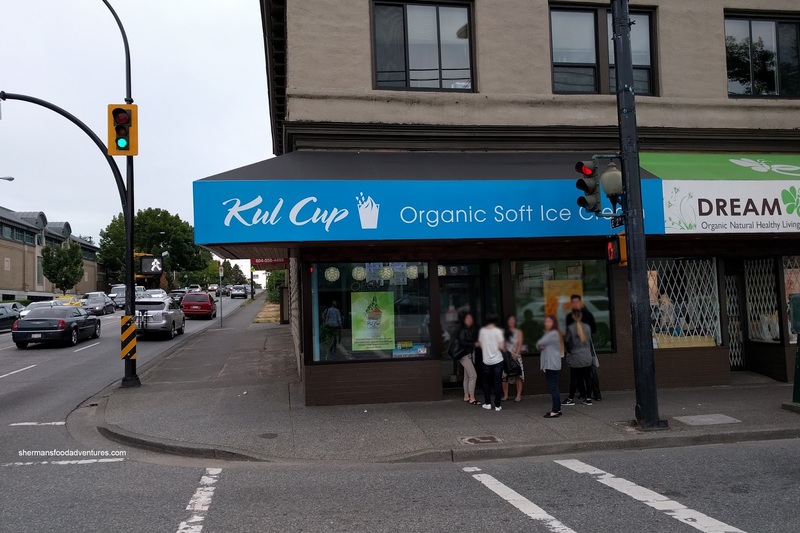 Now we can add another in Kul Cup on Main and 12th which sports the same base of organic Avalon Milk. 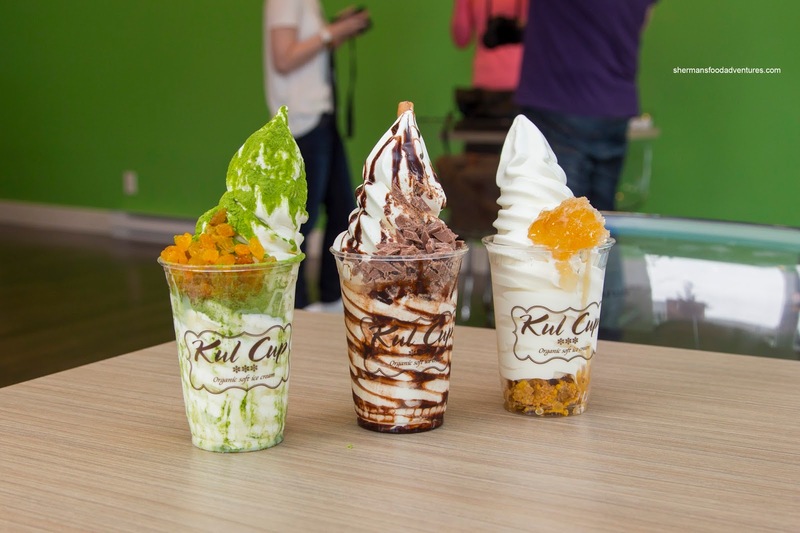 But before we make a direct comparison, Kul Cup offers up different flavour combinations as well as fresh fruit. I recently attended a tasting organized by Jacqueline, where we tried everything on the menu. We began with a trio that included Matcha Slim, Swiss Bliss and Honeycomb. From my first spoonful, it was readily apparent that Kul Cup tasted different than Soft Peaks. It was still creamy and rich, but there was a bit more sweetness and a noticeable bigger impact from the milk powder (offering up big milk flavours). Of the 3 in the picture, my favourite was the Swiss Bliss with Swiss milk chocolate, chocolate sauce and crunchy stick. Despite the visuals, it wasn't overloaded with sweetness, rather, the chocolate really came through. The next 3 sported the Magic Cookies, Caramel Popcorn and Fancy Macaron. 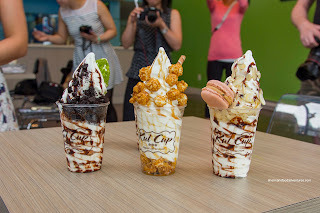 I really enjoyed the caramel popcorn as it added a buttery sweetness as well as an aromatic popped corn essence to the creamy soft-serve. Sure it was sweet, but the sugary firm crunch was the perfect compliment. As the name implied, magic cookies consisted of Oreo bits and chocolate sauce. I liked the texture of the bits, but the chocolate sauce made things rather sweet. Lastly, the fancy macaron was more of a novelty as it was placed on the side. I did enjoy the toasted almonds as it added both a crunch and aromatics. 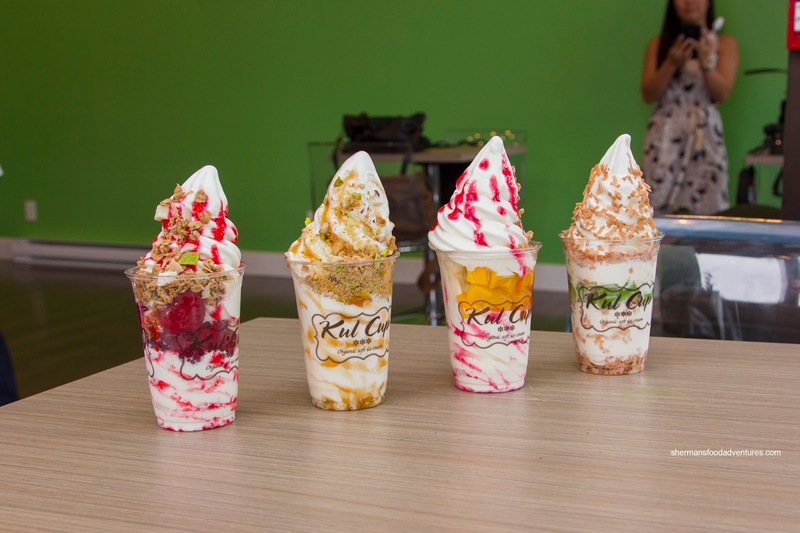 Our last 4 consisted of Raspberry, Summer Love, Tropical Dream and Avocado. As much as it seemed like a weird combo, the best of the bunch was the Avocado since it added another element of creamy richness as well as a mild flavour. The toasted coconut was aromatic and appealingly crunchy. The summer love was no slouch either with a combination of pistachios, cashews and macadamia finished with caramel sauce. Definitely nutty, crunchy and mildly sweet. 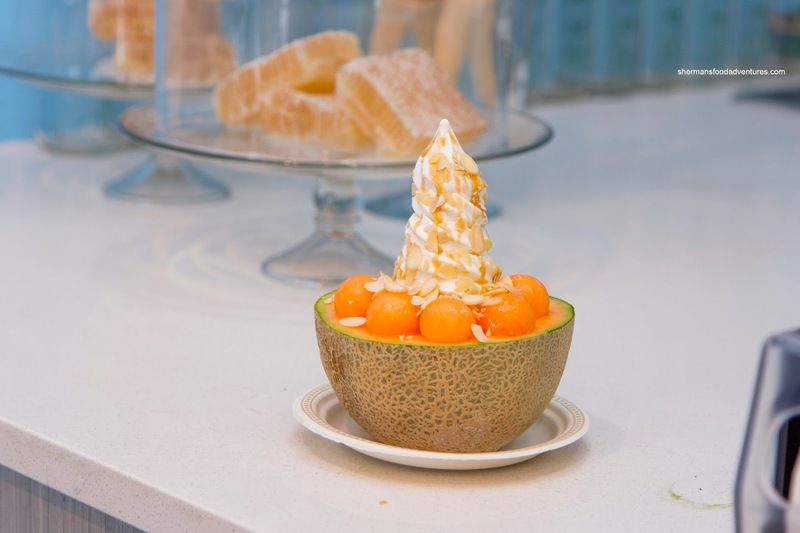 Something unique ended things off with the Green Island featuring a large half cantaloupe with a good amount of soft serve in the middle topped with caramel sauce and toasted almonds. This was rather refreshing and of course fruity. I wasn't convince at the combination of soft serve with cantaloupe, but it was fine. I didn't think the almonds were necessary though. Overall, I liked most of the combinations with the soft-serve with the avocado, caramel popcorn and Swiss bliss being my personal favourites.